April 14, 2017, 11:42 p.m.
Stern tubes of this type are normally constructed of cast iron slightly larger at the forward end to ease removal. The forward end is connected to a doubler plate stiffened aft peak bulkhead and supplied with a stuffing box and with. The after end with a bearing comprising lignum vitae or similar, the wood is dove tailed into a brass bush, the wood is machined and cut on end grain. It can be lined with Lignum Vitae , rubber composition (cutlass rubber) or an approved plastic material .Certain plastics possess good bearing properties being inert and very tolerant of slow speed boundary lubrication conditions. Cresylic resin bonded asbestos s give good results in condition of heavy water contamination in the lubricating oil of almost 100%. 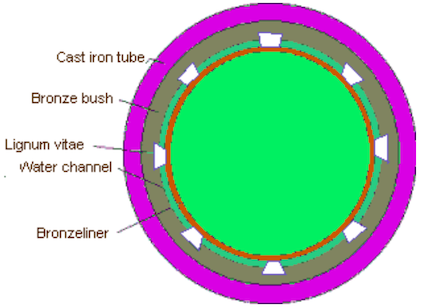 For water lubricated bearing not less than 4 x the diameter of the steel shaft. If the bearing is over 380mm diameter forced water lubrication must be used, a circulating pump or other source with a water flow indicator. The shaft is withdrawn for examination every 3 years. April 15, 2017, 4 a.m.